I’ve had this retro review done for a while, and with Mega Man’s other Game Boy games releasing shortly I thought I best finally post it. 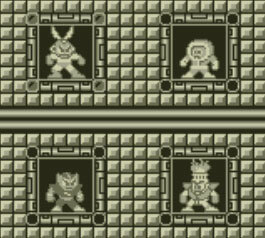 Mega Man’s first GB entry sees mad Dr. Wily at it once again, with the Blue Bomber tasked to save the world. This is before Mega Man games started getting more fleshed out plots, but it serves its purpose fine, especially for a handheld game. In 1991 gamers were simply thrilled to experience Mega Man on the go! 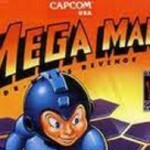 Although the character model on the cover was taken from Mega Man 3 (arguably the pinnacle of the NES series) it borrows elements from the first two games. They were good titles mind you (Mega Man 2 in particular has some rabid fans) but it makes the game feel even more dated today. A shortage of original content doesn’t help. It retains the non linear gameplay of past entries, but it doesn’t impress quite as much here. Not only had we already grown accustomed to it, but the feature is dampened by only being able to pick from four robots at the start. Adjustments had to be made for the GB’s small screen. Larger sprites aren’t bad in themselves (in fact I welcomed them) but it does seem to have made the margin of error shrink, with some enemies particularly hard to avoid. While I don’t think they’re as numerous (the GB could only handle so much on-screen activity) compensation is evident. Much more trial and error sections and less energy are two things of note. The difficulty increase was probably something of a necessity (this is a small game) but it makes an already challenging game flirt with frustration – honestly it’s a bit unbalanced with some inconsistencies. On the 3DS, restore points are available to take advantage of, but you really want to be familiar with the stages – they can certainly be helpful, but you need to know when and where to use them as one screen can wipe you out! Still, I’m happy to have and use them. It may sound like I’m being overly critical, and perhaps I am, but Dr. Wily’s Revenge does have plenty for me to praise. The graphics translated over well to the GB, and I remember being impressed by them back in the day. They’re even better on the 3DS – no more blur! The music also fares well on the tiny GB speakers, a good thing since Mega Man games have such catchy music! Control is good and responsive, and overall the design reminds me of why I grew to like the series in the first place. I feel that Dr. Wily’s Revenge is somewhat mixed and dated, but for a GB debut it’s quite respectable. Has it held up as well as the NES games? No, definitely not, but nostalgia is a funny thing – I bet many won’t care about how well the game’s aged. It really isn’t that fair to overly compare it with its console counterparts anyway. Bottom line is that this game’s still a must for big series fans. Others might consider it on the bubble, with the low price battling the dated aspects and punishing difficulty in deciding whether to download it or not. 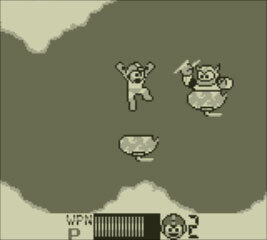 Shortcomings and all, Mega Man Dr. Wily’s Revenge was nonetheless a Game Boy classic, and deserves props for launching a successful handheld series.